a solid organic substance that has, or acquires as a result of external factors, n-type or p- type conductivity. Organic semiconductors are characterized by the presence of a conjugated system in their molecules. The charge carriers in organic semiconductors are formed as a result of the excitation of π-electrons delocalized with respect to the system of conjugated bonds. The activation energy necessary to form charge carriers in organic semiconductors decreases as the number of conjugations in the molecule increases, and in polymers it may be of the order of the thermal energy. Organic semiconductors include organic dyes, such as methylene blue and the phthalocyanines; aromatic compounds, such as naphthalene, anthracene, and violanthrene; polymers with conjugated bonds; some natural pigments, such as chlorophyll and β-carotene; charge-transfer molecular complexes; and ion-radical salts. Such semiconductors exist as single crystals and as polycrystalline or amorphous powders and films. 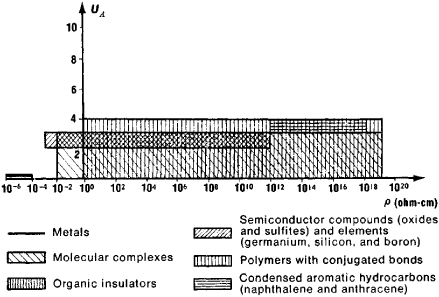 The values of the resistivity p of organic semiconductors at room temperature range from 1018 ohm-cm for naphthalene and anthracene to 10–2 ohm-cm for ion-radical salts (see Figure 1). Ion-radical salts based on the anion radical of tetracyanquinodimethane are the most conductive organic semiconductors. They display metallic-type electrical conductivity. The phenomenon of photoconductivity is observed in organic semiconductors with low electrical conductivity. An organic semiconductor has a number of properties that are determined by the molecular character of its structure and by weak intermolecular interaction. (1) The absorption of light causes a molecular excitation that can migrate through the crystal in the form of excitons. (2) The formation of charge carriers under the action of light is due to the decay of excitons on the surface of the crystal, at structural defects, and at impurities when exciton-exciton interaction occurs; it may also be due to the autoionization of highly excited molecules. (3) The conduction bands are narrow (~0.1 electron volt), and the mobility of the charge carriers is generally low (~1 cm2/volt-second). (4) In addition to the band mechanism of electrical conduction, the hopping mechanism may operate. In crystals of ion-radical salts, the intermolecular interaction is strongly anisotropic. For this reason, the optical and electrical properties are highly anisotropic, and such organic semiconductors can be regarded as quasi-one-dimensional systems. Organic semiconductors are used as photosensitive materials in, for example, information recording processes. They are also used in microelectronics and in the manufacture of various types of sensing units. The investigation of organic semiconductors is important for understanding the processes of the conversion and transfer of energy in complex physicochemical systems, especially in biological tissues. Organic semiconductors such as ion-radical salts are expected to provide the basis for the development of superconductors with a high critical temperature. Organicheskie poluprovodniki, 2nd ed. Moscow, 1968. Boguslavskii, L. I., and A. V. Vannikov. Organicheskie poluprovodniki i biopoiimery. Moscow, 1968. Albemarlea[euro](tm)s offering in the electronic materials market now includes the light emitting diodes (LED), semiconductor, organic light emitting diodes (OLEDs) and laser segments. Albemarle's offering in the electronic materials market now includes the light emitting diodes (LED), semiconductor, organic light emitting diodes (OLEDs) and laser segments. To be published six times a year, it will cover properties of semiconductor, organic, inorganic and hybrid nanostructures, applications of superlattices and quantum structures, circuit and device integration, information processing and optical communications.